This chapter underlines the necessity of establishing a carefully thought-out method to answer precise questions. We will also use this opportunity to discuss the possibilities and difficulties generated by the use of computers to record and process data from archaeological excavations. Which reflections lead the archaeologist to use a particular tool? The amount of data-processing software for the treatment of various types of information (word processing, spreadcards, CAD, data bases, GIS, etc.) is continuously growing and developing. 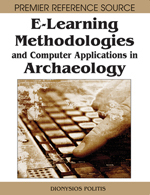 While it is obvious that the use of certain software facilitates the analysis of archaeological data (up to the point where it becomes essential to the archaeologist), is it also necessary to constantly adapt archaeological data processing methods to the use of new software?